Heavenly blog! : No. 1317: Jan Aage Torp is emerging as a star psychopath when he demands money from me to use a facsimile itself from newspaper Norway today! No. 1317: Jan Aage Torp is emerging as a star psychopath when he demands money from me to use a facsimile itself from newspaper Norway today! Jan Aage Torp is emerging as a star psychopath when he demands money from me to use a facsimile itself from newspaper Norway today! Fax Mile there Jan Aage Torp demand money from me for having taken this from the newspaper Norway today (the man is obviously "crazy" when hatred against me and the Heavenly blog is about to eat him up completely). Facsimile of Torp where he meets with the Attorney General, to discuss the case against me. And he will have the money that I have a facsimile of this, as he lies with that it has no relevance. We face a star psychopath and mockery apostle, and he called in January Aage Torp. The media uses extensively by facsimiles. In other words, when I reproduces a facsimile which I referred. And then say this is a picture, we lie a simply! It is of course allowed to have a facsimile in which a self-referred, and a reply to this. Each also if one writes about a topic, this makes January Aage Torp constantly. But when it suits him, and he will even check not only its own site, but the newspaper Norway today too. In other words, we face a star psychopath and mockery apostle who need to hear that enough is enough. Here I repeat the last mail from him, in which he demands money by fax mile. And lying to say that I did not write relevant, although he writes about me. The man is obviously so ruled by løgndemoner he obviously must be possessed! This is from the mail today from Jan Aage Torp. 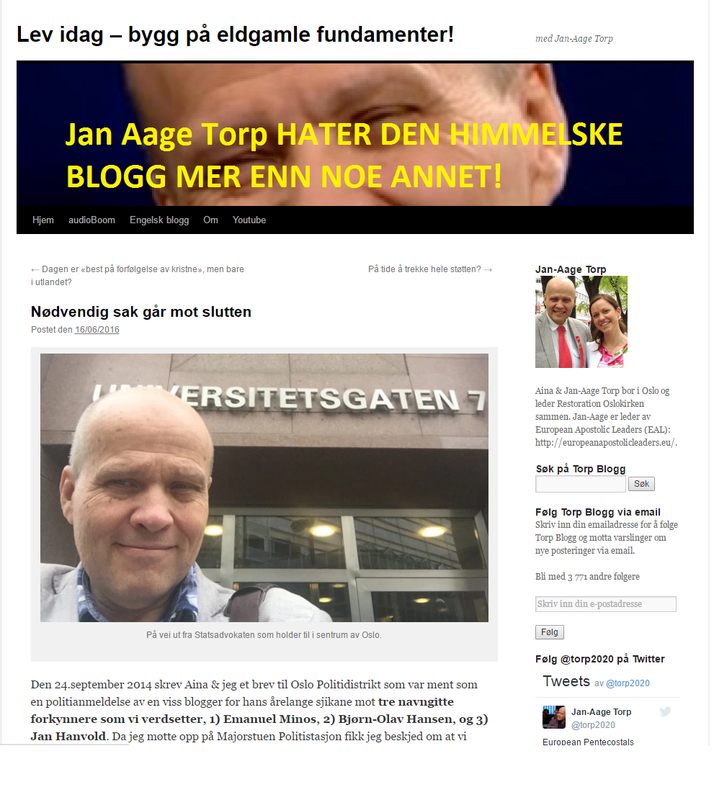 We have this morning discovered that the new uses photographs of Jan-Aage Torp on your blogs that you're not allowed to use. We give you the opportunity to remove them immediately, ie before 18:00 today, August 30th, 2016. If they are not removed within this time limit, we will bill you. If they are removed within this period, we will refrain from charging you. Your abuse is serious in itself because these intellectual belongs to us. It is also not allowed to take a screenshot that you call a "facsimile". Such push-facsimiles must always be linked to a relevant aspect of the specific article you are photographed, and it makes you not at all. In addition to that we notify you of invoices with the first, we will appeal to the most elementary common decency and sense of justice. It is obvious to refrain from such thefts. We see that you use a lot of photographs of our leaders who fetched media Norway Today, Our Land, VG, Dagbladet ETC., but there is a relationship between you and them. Our request to you therefore applies to our own intellectual property. You will not get another notice before we send you an invoice. If you pay an invoice from us, this will be regarded as compensation for the abuse you have already committed, but you'll still have to remove the photos immediately. Our real goal is not to collect money but to deny you the use of our photographs according to the Copyright Act. We do not want our intellectual property will be associated with you. We sell photos to some media, while other media, we lend free of charge to use only their medium. However, we will not let you use our intellectual property at all, and they must be immediately removed from your blogs. No name, is not taken seriously! Inquiries from our office are authored by different people, and we are all authorized to write and answer. Failure to follow up immediately, you will get the necessary demand. Please clean up immediately in your copyright infringement. Have been told by Runar office Norway today that picture I could use, and fax mile image can certainly use. There is also a photographer and the whole package! Got this email from Norway today about the offer to acquire the image that I have taken advantage of! We have seen that you have used an image on your blog, taken by our photographer Marion Hasli, we own the rights. We have not given permission to use, and asks that this picture is taken away from your blog. Otherwise, we will bill you for the repeated use in accordance with current rates. We ask for your feedback on this, and confirmation that the images be removed. We do not interfere into what Norway Today or others do. If they own the rights to an image that you use, they must decide whether they will permit you may use them. As you know, we will not in any way allow you to use our intellectual property. We refer here to the judgment of 25 January 2016 in Oslo City Court concerning your hate crime, specifically against Pastor pair Aina and Jan-Aage Torp and we will not be used to support your hatkrim activities against them. The images we ask that you remove immediately are images that we own the rights. About Norway Today were allowed to use any of these images in 2009 in their publications, is a matter between us and them. You must imdlertid remove the image immediately from your blogs. 18:00 Today is the deadline. It surprises us Norway Today by Runar has said to you what you wrote to us now: "Have been told by Runar office Norway today that picture I could use, and fax mile image can certainly use." As we have explained to you earlier, the press facsimiles which are approved to render a portion of the current article in a newspaper or website, and no one can use to circumvent intellectual property theft. It is true that Norway Today accept such as surprise me, but we accept it or at least not from you. We follow the lenient rules and standards for our partners and serious media companies, but not with a man who deliberately violate hatkrim laws. All images must be removed within at 18:00 today. Contact Finn Jarle Sele, he is all contact is going to happen between you. I've talked with the Data Protection Authority, they said fax mile pictures where Torp has written about me etc. To demand money this was unheard of and not legal! Your "facsimiles" has nothing to do with what the relevant articles reviewing, therefore they are not facsimiles but copyright theft. 1) You are abusing header in Pastor Torp's blog, including photo. This is not facsimile but theft. 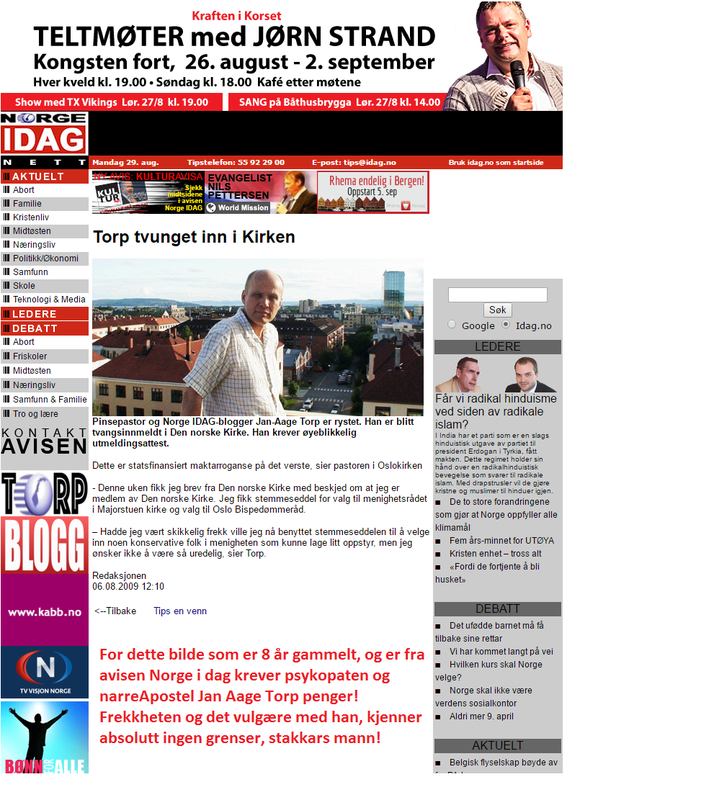 2) You are abusing picture of Pastor Torp from an article on August 6, 2009, which included that Torp had been "forced" into the state church. You write about something else entirely. Therefore this is not a facsimile. 3) You are abusing picture of Pastor Torp front Universitetsgaten 7 on 16 June 2016 concerning a conversation with the public prosecutor. Your blogs do not mention this. Therefore this is not a facsimile. You must remove all these abuses within 18:00 today. Torp writes about me, and I will not use this as a rebuttal in a fax mile? You lie worse than ever! I answer here in this they accuse me of. I write about Torp and what he stands for +++ much more! It was this image all concerned! It was to discuss the matter concerning me, that I answer in our own blog and then uses this as fax mile is something that everyone does, for any spray they come with! January Aage Torp even use / abuse (if what I do is abuse, and he does the same thing myself, and then it is also abuse) facsimile images in a large calculation itself. In other words, it is "legal", but if I and everyone else does the same, then it is a crime and punishable. But it is not an abuse to create a facsimile, and uses an also an image that is 10-15 years old, as I have just done. And Torp has even been doing the same. He has also taken facsimile of the Heavenly blog and laid out, no problem. The problem is and remains a person, it is a mockery apostle January Aage Torp, not anyone else! We face a star psychopath and mockery apostle, he is revealed to anyone and everyone! Torp even under writings about me taken pictures of me from our website, the newspaper Our Country, from the Heavenly blog etc. Should I demanded he money and other? As I have written and spoken against him? 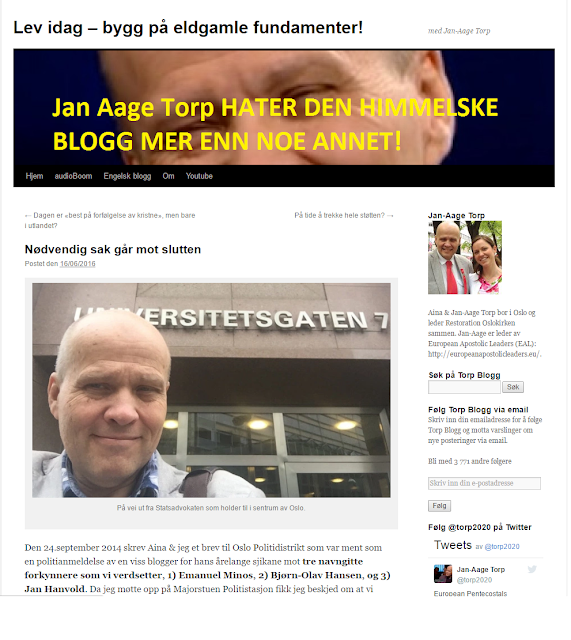 Never, it is the enormous hatred as Jan Aage Torp has to me and the Heavenly blog that is the problem, not anything else! Heb. 12. 15 And heed that no man recoils from the grace of God, lest any root of bitterness grow up and become men, and many will be infected by it. Here is not only infected, but it's about to eat him up inside, it's just looking at his face and eyes! "For blasphemed the name of God among the nations, as it is written." That is what we see today, not a minister in Norway's history has been a degree mocked, laughed at and ridiculed as a fool apostle and star psychopath January Aage Torp! all start? After he reviewed me and the Heavenly blog. Talk about God enters into judgment, then judgment! Repent selected Jan Aage Torp, and that seek him out, then only this the beginning of all this misery!